Note: This plug-in is included in the Rhino 5 WIP. Command name is EditScript. Monkey is a script editor in Rhino 4 which can be used to edit, run, debug, and compile scripts. It contains all the standard programmer editor features such as Find/Replace (with regular expressions), multi-document interface, code trees, and integrated helpfiles. Monkey also comes with a separate application called the Monkey Script Compiler. This standalone exe turns .rvb scripts into .rhp plug-ins. More information on the script compiler is here. If you are a plug-in developer and have extended RhinoScript to use your plug-in methods, then you can access your methods from Monkey. Click here for details. The Script Compiler is a standalone program (not a Rhino plug-in) that lets you compile any number of scripts into a single Rhino plug-in. The Script Compiler has its own wiki pages. 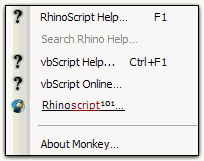 The Monkey script editor is a Rhino plug-in, not a standalone application, meaning it can only be run inside of Rhino 4. You can either run the _Monkey command or open the editor via the Monkey menu. After a short delay the Monkey Editor will display. (Yes, we know. We're working hard to get it to load faster.) Since the editor is likely to be displayed as a large window, we've made it nondockable. By default, the window links to Rhino, meaning that if you minimize Rhino, Monkey will also disappear. It is possible to unlink Rhino and Monkey, but we'll get to that in the menu section. The following sections deal with all the user interface elements of the Monkey window. The most important item on the Monkey Editor is the Code Editor. It is here that you make your scripts. As you can see, the editor is much more than a simple text editor (a la notepad). It performs automatic syntax parsing. You get properly colored keywords, collapsible code groups which encapsulate Sub() and Function() blocks, automatic indenting, autocompletion, and error highlighting. Note that the autocompletion list pops up as soon as Rhino is typed anywhere. The list updates as you type to reflect the best possible match with your current text. In this case, we want to use the Rhino.GetObject() method but we have to type at least geto to get it. (Rhino.GetAngle() comes earlier in the alphabet and is the initial provided solution.) Once the Rhino.GetObject() method is highlighted in the pop up list, we can press Enter and the complete method name is inserted into the script. Once the method name is in place, we have to supply the arguments. IntelliSense displays a tooltip showing us the required arguments and which one we are currently setting. 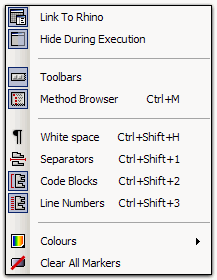 Above the code editor is the document tab. Monkey is multi-document capable and you can switch between documents by clicking on the appropriate tab. You can also quickly add existing files by dragging them onto the file tab. If there are too many files in the tab to show on a single screen, you can scroll the bar left and right by click+dragging the ◄ ► icon. Also, if you press the right mouse button on the tab, you'll get a menu with all loaded files so you can quickly locate the correct one. The status bar provides feedback on the location of the caret in the currently active script. It gives both line and column coordinates, as well as procedure scope coordinate. You can jump to a specific line in your script by using the Go to line… dialog, but you can also scroll the line index field in the status bar. Just click+drag up and down and the currently selected line will be scrolled. The status bar exposes another quick navigation tool. If you click on the procedure scope field (the last field on the status bar) you will pop up a menu listing all defined Sub() and Function() procedures. Click on one of the names to jump to that procedure. If the caret is not inside any procedure body, the status bar will read Global scope. New Script Ctrl+N Create a new script file with a custom header. Open Script Ctrl+O Open an existing file. Save Script Ctrl+S Save the currently active script. Save All Scripts Save all changes to all loaded scripts. Save Script As Ctrl+Shift+S Save the active script under another name. Debug Script Ctrl+F5 Run the active script with breakpoints enabled. 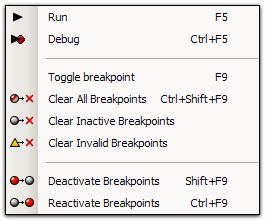 ● Clear All Breakpoints Ctrl+Shift+F9 Remove all breakpoints from the active script. ● Clear Inactive Breakpoints Remove all deactivated breakpoints from the active script. ● Clear Invalid Breakpoints Remove all invalid breakpoints from the active script. ● Deactivate All Breakpoints Shift+F9 Deactivate all active breakpoints. ● Reactivate All Breakpoints Ctrl+F9 Reactivate all deactivated breakpoints. Find Ctrl+F Search the active script for a specific string. ● Find Next F3 Find the next occurance of the selected text in the active script. ● Find Previous Shift+F3 Find the previous occurance of the selected text in the active script. ● Find In Files Ctrl+Shift+F Search all loaded scripts for a specific string. Replace Ctrl+R Replace one string with another in the active script. Go To Line Ctrl+G Display the Go To Line dialog for the active script. Google Groups Perform a Google search for the specified keywords. The toolbar can be deactivated through the View menu. The MRU list (Most Recently Used) in Monkey is one of my most precious creations. Not that it is extremely advanced, it's just more advanced than other MRU menus out there. It displays a list of 15 files (15 by default – you can set a different number in the options) that were last saved by Monkey. The cool part is that it automatically hides files from the list that no longer exist, without shortening the list. Also, if you then restore these files, they will reappear in the menu. Not just when Monkey starts, but whenever you open the menu. I guess you have to be a fairly lost cause to appreciate that kind of thing… so be it. This feature lets you export your script file to *.html, .rtf and .xml while preserving the formatting and highlighting. You can also save the text as unicode. 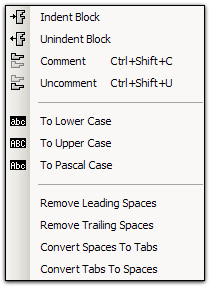 This menu item will enable/disable the ASCII browser dialog. If you ever use Chr() or Asc() functions in vbScript it is a great help. This menu item will enable/disable the vbScript Constant browser dialog. vbScript comes with many predefined constants, all which are listed in this little dialog. View » Link to Rhino. With this option you can make Monkey behave more like a stand-alone application. By default the Monkey window is a child of the Rhino window, meaning it will minimize whenever Rhino minimizes, and it will always be on top of Rhino. 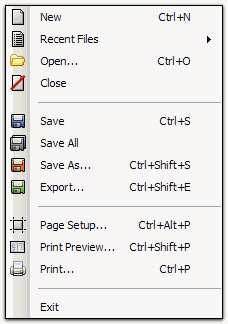 If you disable the link, Monkey will get its own icon on the taskbar and it can go behind Rhino. If you close Rhino it will still close Monkey as well. View » Hide During Execution. Usually when you run a script, you need the complete Rhino interface so it is annoying to have Monkey occlude the window. By default, Monkey hides itself when it starts to run a script. You can disable this by unchecking this menu item. If Monkey isn't hidden, it will instead lock its UI so you cannot make changes to a running script. View » Colours. You can change some of the syntax highlighting colours from this submenu. View » Clear All Markers. If you use the Mark All button on the Find/Replace dialog, Monkey will add little widgets in the gutter area on every line that contains a match. You can clear these using this menu. Help » RhinoScript Help. The RhinoScript helpfile which resides in Program Files\Rhinoceros 4.0\Plug-ins. Help » Search Rhino Help. This menu item lets you search the normal Rhino help file for command names. Help » Custom Help. You can set the target of this menu to a custom helpfile or webpage. In my installation it points to a Microsoft vbScript helpfile. Help » RhinoScript101. Takes you to the RhinoScript 101 wiki pages.